Very, very few dumb car branding exercises are any good. The Ford Explorer Eddie Bauer edition just had some leather. The Lincoln Continental Mark VII Bill Blass edition had... something? Maybe? Was he a golfer? It’s hard to say. 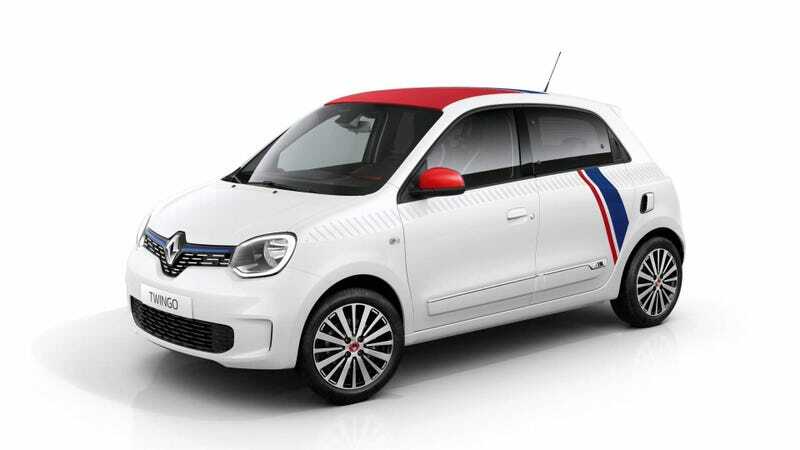 But this little Renault Twingo Le Coq Sportif edition just looks so, so good. “Le Coq Sportif,” as is the name of this car, translates to, uh, “The Athletic Rooster.” And while it’s a very strange name for both a car and the French sportswear brand Renault has partnered with, it just works. Look at the blue stripe. Then look at the red stripe. Then look at all the little hash marks down the side. Look at the little blue bit in the grille. Now look at the roof, all blue and red and white and perfect. But the Twingo is a cheap little French hatchback (not for sale here in the U.S., it nearly goes without saying) that doesn’t just have an interesting color scheme, but it actually looks good. Of course, it also comes in a gray or a black version, but they’re boring and lame and who the hell cares. This little hatchback isn’t just for looks, either, it’s probably a ton of fun to drive, too. Sure, it’s only powered by your choice of three-cylinder engines, according to the official release, but the only transmissions offered are a five-speed manual or a six-speed dual-clutch. And both of those are great. No CVT menace here at all. Get me a French coq sportif. Je le souhaite plus que tout!